Junior forward Cyera Hintzen's second goal of the season helped the Texas soccer team tie No. 4 North Carolina in Chapel Hill (photo courtesy of texassports.com). CHAPEL HILL, N.C. — Junior forward Cyera Hintzen scored in the second minute and goalkeeper Nicole Curry registered four saves, including one on a penalty kick, to help the No. 21 Texas soccer battle to a 1-1 draw against No. 4 North Carolina at UNC’s Finley Field South. 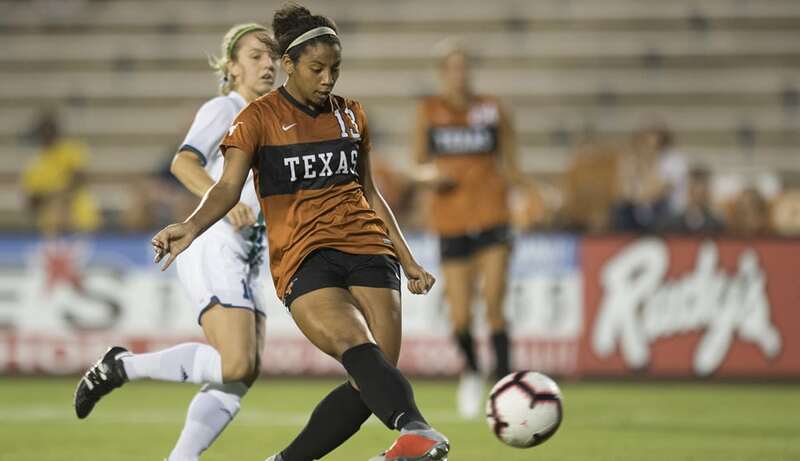 The tie dropped the Longhorns’ season record to 1-0-1 after their season-opening 3-0 win over Rice, while North Carolina’s record now stands at 2-0-1. Her goal was the second of the season for Hintzen, who during the preseason was named to the preseason All-Big 12 team and was listed on the watch list for the Hermann Trophy, which is given annually to the nation’s premier men’s and women’s players. The result was impressive for Texas against one of the nation’s perennial heavyweights, especially since Carolina outshot the Longhorns, 20-9, and held a 6-5 edge over their guests in shots on goal. The opportunistic Hintzen gave her team a 1-0 lead over the Tar Heels just 70 seconds into the match when she collected a loose ball after a UNC defensive turnover, beat one defender and then first a shot past goalkeeper Samantha Leshnak. Curry contributed arguably the game’s biggest play in the 24th minute when she turned away a penalty kick by Carolina midfielder Dorian Bailey and then swallowed up Bailey’s follow-up shot. The Tar Heels got the equalizer in the 53rd minute on a 12-yard shot by forward Taylor Otto after assists by Rachael Dorwart and Brianna Pinto. The Heels generated multiple offensive chances, but Curry and the Texas defense made the score hold up, including one chance in the 71st minute, when UNC’s Elliott McCabe broke through the Texas defense before firing wide of the net. The Longhorns’ next game also will be in Chapel Hill; UT faces No. 23 UCF at 4 p.m. Friday before playing their next seven games in Austin.